HDD Spotlight Bargain: 'Rocky: Undisputed Collection' Blu-ray $22.49 at Amazon! Yo Adrian! Amazon delivers a knockout punch for Black Friday week! 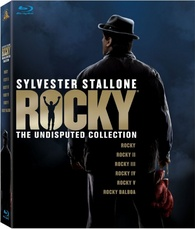 The online retailer has just reduced the price of 'Rocky: Undisputed Collection' featuring Sylvester Stallone in his iconic role even further to just $22.49 (68% off suggested list price). The set includes all six movies plus a seventh bonus disc of supplements: “Feeling Strong Now!” Trivia Game; Three Rounds with Legendary Trainer Lou Duva featurette; Interview with a Legend – Bret Sugar (Author/Commentator and Historian); “The Opponents;” In The Ring: Three-Part Making-Of Documentary; Steadicam: Then and Now with Garrett Brown.